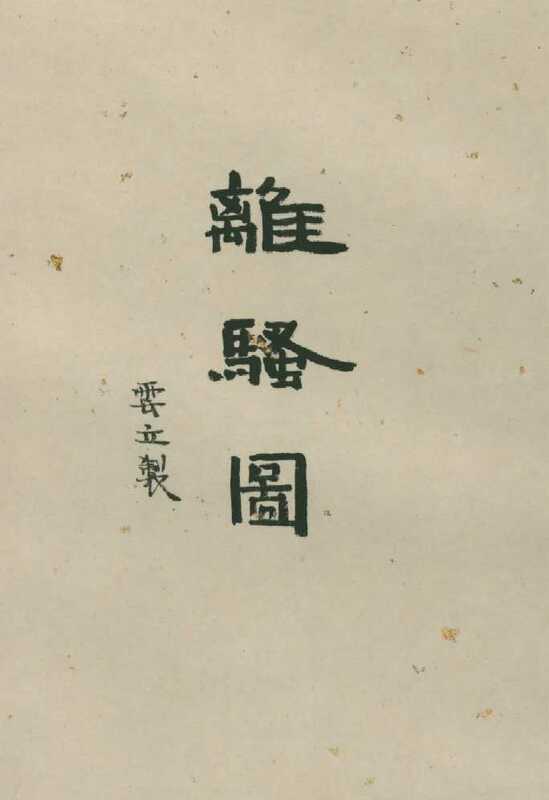 The preface to Li Sao in Shen Qi Mi Pu says that there are two qin melodies called Li Sao, one of 18 sections written by Qu Yuan himself, and one of 11 sections written by later people in memory of (Qu Yuan). It gives some biographical information on Qu Yuan, saying that he wrote Li Sao in despair after he had been slandered. He wanted to persuade his sovereign of his loyalty and of the wisdom of his advice. However, the king did not take the advice and the country collapsed. Qu Yuan could not bear this and so he expressed these thoughts on the qin. In Shen Qi Mi Pu, Li Sao follows Zepan Yin and a modal preface, Shenpin Qiliang Yi, which introduces aspects of the mode, which uses the tuning 2 4 5 6 1 2 3 . The illustrations here by Bai Yunli follow the section titles of the qin melody. As is explained in Sources of the online Chu Ci Illustrations), they are largely in the style of Men Yingzhao (active during 1736-1795), who did 32 such illustrations for Li Sao. About 12 of them correspond with section titles for the qin melody, and so Bai Yunli's images for these are largely copies of the Men Yingzhao's originals (which may well have been based on earlier images of the same scenes). For the remaining images Bai drew on elements from similar illustrations to put together scenes appropriate for the section titles.